Bowers Group has donated an XT Digital Bore Gauge Set to the Engineering Department at Weymouth College, providing students with valuable experience of using a simple, accurate measurement solution likely to be encountered in their future careers in industry. Geoff Williams, Lecturer in Engineering at Weymouth College said: “The XT Digital Bore Gauge from Bowers Group is of great benefit to my students. It allows them to measure internal dimensions, including bore diameters, to exceptionally tight tolerances. We are delighted that Bowers Group has kindly donated the bore gauge to the college, and that they recognise the value in contributing to the quality education of the engineers of the future. 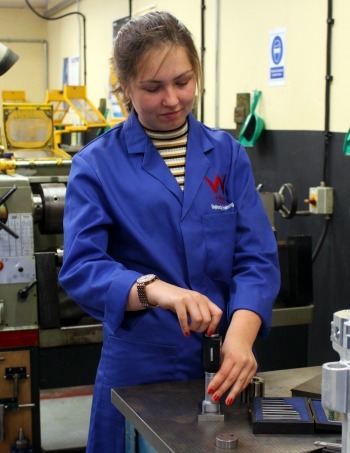 As part of their engineering qualifications, the students at Weymouth College need to be able to demonstrate that they can carry out a range of measurement techniques and use the equipment competently. The college required students to carry out the inspection of a shallow 40mm bore, but previously could only offer digital calipers to perform this task. Unfortunately, in relatively inexperienced hands, the digital calipers were not nearly reliable enough. The college, therefore, needed an instrument that would be better suited to inexperienced hands, in order to achieve the measurement task required and enable the students to demonstrate their competence with metrology equipment to meet the demands of their Engineering course. Bowers Group supplied Weymouth College with an XT Digital Bore Gauge Set, with a measurement capacity of 20-50mm. The XT digital internal Micrometer boasts a large, clear LCD display and IP67 electronics protection. Its proximity output allows bi-directional communication, giving greater flexibility for data acquisition and storage, which could be useful for the collection of SPC data in a later part of the students’ course. The extended mechanical travel of the XT range means that special heads can also be manufactured to accommodate users most awkward measuring problems, for example; threads, splines, slots, grooves, deep-holes and many more applications. The bore gauge is perfect for use at Weymouth College. The ratchet stop ensures consistent measurement, and the precision setting rings mean that the bore gauge is set and ready for the students to use. The 3 point design means that the bore gauge naturally centres itself in the bore, making measurement quick and simple, and unlikely to be mistaken by the students. It is also more representative of the equipment likely to be encountered in industry. To illustrate the fool proof nature of the bore gauge, 2 engineering students used it for the first time and compared measurements. Although they had only been briefly shown how to use it, the first time they handled the bore gauge and made a measurement revealed only a micron difference in their measurements, which is the equivalent to one thousandths of a millimeter. Bearing in mind that the width of the average human hair is 75 microns, this is an exceptionally small discrepancy in the two measurements taken by extremely inexperienced hands. More traditional methods of measurement, for example; calipers, micrometres, and telescopic gauges, do have their drawbacks in an educational environment. Although a skilled inspector can achieve accurate results with a good level of experience and practice, students often find them fiddly and struggle to achieve accurate, repeatable measurements. When measuring bores, students need to make sure that the micrometer in use is placed exactly over the widest part of the hole in order to achieve an accurate result. And with Vernier calipers, excellent eyesight is needed to read them to 100th of a millimeter, therefore differing measurements from operators can occur. In addition, equipment such as this needs calibrating once a year, which takes time and can be expensive. Located in West Dorset, Weymouth College is a further education college with over 3,000 students. The college offers an ever expanding range of practical and academic courses in a wide variety of traditional and non-traditional subjects and is a partner institution of the University of Plymouth. As part of its curriculum support the College has a variety of commercial outlets on site including a 250 seat theatre, a fully operational training restaurant, hair and beauty salons, and the Weymouth and Portland Adventure and Redlands Community Sports Hub. The College is very active in apprenticeship provision and recently launched the Dorset Training Academy, specifically developed to continue the partnership between business and education into the workforce at all levels.